Dutch painter and printmaker, active in Italy. He studied from 1783 at the Stadstekenakademie in Amsterdam and subsequently with the wallpaper painter Jurriaan Andriessen. The financial aid of the Amsterdam art collector D. Versteegh (1751-1822) enabled him to depart in 1788 for Rome to obtain further training in landscape painting. Voogd s works from his first Roman years are primarily drawings with coloured wash in the typical late 18th-century linear style; an expressive example is River Landscape near Narni (1789; Haarlem, Teylers Museum). Owing to the absence of Dutch colleagues in Rome, Voogd spent much of his time with the Franco-Flemish and German artists colonies there. Internationally famous landscape painters, such as Nicolas-Didier Boguet, Johann Christian Reinhart and Johann Martin von Rohden, were among his close friends, and the work of the last, in particular, is often mistaken for that of Voogd. It is apparent, from one of the infrequent letters that Voogd sent to Versteegh in the Netherlands, that he made numerous drawings of Rome and its environs (Tivoli, Lake Albano, Castel Gandolfo, Lake Nemi etc). Some of these drawings, executed mostly in pencil and black chalk, consist of motifs taken directly from nature, such as trees and rocks; others portray views. Both categories are represented in Amsterdam (Historisch Museum and Rijksmuseum). Voogd claimed that his great exemplar, in addition to nature, was Claude Lorrain; from shortly after 1800 he was named the Dutch Claude Lorrain . Although this nickname is somewhat exaggerated, it does indicate that Voogd s style had developed between 1795 and 1805 from an austere draughtsman-like manner into something far more picturesque. 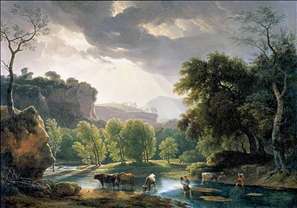 Examples illustrating this development include his Italian Landscape with Umbrella Pines of 1795 (Amsterdam, Rijksmuseum) and two Italian landscapes (private collection) from 1802 and 1803. However, Voogd never completely abandoned his Netherlandish heritage: he was fascinated by unusual lighting effects and luxuriant foliage (e.g. 1804; Leipzig, Museum der Bildenden Knste) and from 1806 onwards was fond of drawing animals, particularly cattle (1806; Hamburg, Kunsthalle). Italian cattle began to feature prominently in his drawings and paintings (1817; Bassano del Grappa, Museo Civico; and 1829; Heino, Hannema-de Stuers Fundatie). See more details about "View of the Roman Campagna"